It is widely believed in FFS circles that the male hairline is higher and has an “M” shape while the female hairline is lower and has a rounded shape. The shape difference is very true – female hairlines do tend to be rounded as opposed to “M” shaped or square - but I found time and time again that the height difference is only partly true and that bringing the whole hairline forwards is not only unnecessary in a majority of cases but can sometimes even be detrimental and mildly masculinising. 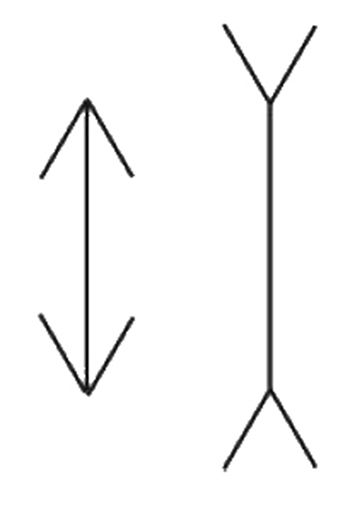 The vertical lines are still the same length, but it looks longer with the male-shaped hairline on the right. 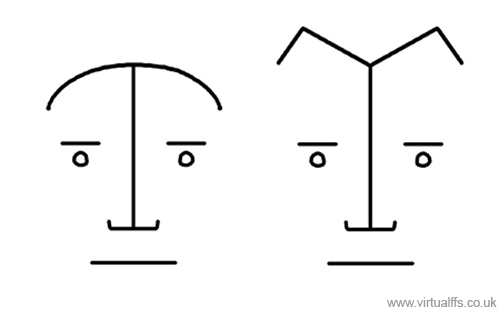 In other words, both hairlines are the same height in the middle, but shape of the male hairline makes it look higher in the middle than the female hairline. I think this explains why we so often see male hairlines as higher, even when they are not. Despite the evidence of the prototypes, some studies based on facial measurements suggest female hairlines are lower, One possible reason is that examples of male pattern baldness have gotten into studies where hairline heights are averaged. That would skew the results (I've not found any such study but it's a possibility). Another possibility is that the absolute height of a female hairline in millimetres might actually be less than in males but of course you would have to take into account that women are on average smaller than men so although the absolute height might be less on women, the proportional height might be less on men - perhaps someone overlooked this but again I have not seen any research on this yet. The results may also vary depending on whether you measure the vertical height of the hairline or include the tendency for male foreheads to slope backwards a little or if you use a tape measure that follows the contours of the brow bossing. The fact that many patients and surgeons believe women to have lower hairlines does cause a problem because it sometimes leads patients to have surgery to move the hairline forwards with all the scarring and trauma that entails, when they don't need it and when, in some cases, it can even be detrimental. Another complicating factor here is that males tend to have a taller lower third to their face so the distance between their nose and their chin is longer in relation to the rest of their face than it is in women. This long lower third can be emphasised by having a short upper third so, in other words, a low hairline can make your jaw and chin look taller and that can be masculinising and this in turn means that a slightly higher hairline than the male average can actually be an advantage for some TS women rather than the problem that many assume. Male hairlines sit a little lower on average than female ones. It's not a huge difference and the average male hairline would still fit into a wider range of normal female hairlines – it would just be in the lower range for normal females. The problem comes when you take one of these average male hairlines and lower it further - you then run the risk of taking it beyond the lower range of female hairlines into an area that is so low, it is usually only seen on men. In addition to that, if you move it forwards with a scalp advance, you have to consider the trauma and visible scarring along the hairline. Another consideration here is that some patients and surgeons may worry unnecessarily about the fact that a brow lift can cause the hairline to be raised when this may actually be an enhancement. The procedures to raise the brows without raising the hairline involves the trauma and scarring of a long incision along the hairline when in many cases, a much less invasive endoscopic brow lift with a modest raising of the hairline would have been much better. Some masculinities are more important than others! In this case then, the shape of the hairline is much more important than the height. I'll have more to say on the relative importance of different masculinities in part 7 of this thesis “Objective and Subjective femininity” and you can read more about the hairline in part 5 “relative proportions” under the "lipuhai rule". It is also often said that female eyebrows sit just above the orbital rim while male eyebrows sit on it or just below but I would suggest that this is not really to do with eyebrow position but about the size of the orbital rims and the under-eyebrow plucking of women. So, given roughly the same eyebrow top edge position for men and women, the male eyebrow can still be lower relative to the orbital rim because the orbital rim itself is bigger and extends above the eyebrow whilst women's eyebrows sit along the top edge of a smaller rim This apparent position at the top of the rim is then emphasised by plucking away the underside of the eyebrows. Personally, I would like to see fewer brow lifts overall in FFS and less extreme ones in many cases but brow lifts still have an important role to play and one useful trick is raising the eyebrows a little to de-emphasise the height of the chin. A good candidate for this would be someone with a tall chin and who's eyebrows are already low or in a medium position. It's not a rule and there will be many exceptions but it is one possibility for a face with a tall chin and low to average eyebrow height. The brow lift can also help to give a more open-eyed expression which is a female trait and it's a very useful procedure for rejuvenation as the eyebrows do drop as we mature. To sum up then: the brow lift is a useful procedure in FFS but it should not be performed solely on the incorrect assumption that women have higher eyebrows than men. 1. The square shape of the jaw corners is reasonably well hidden by soft tissues and doesn't show through particularly clearly. 2. 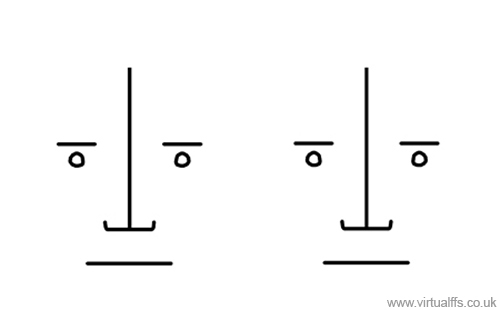 The squareness is seen from the side and the side of the face does not get a lot of attention in human interactions – our attention is more focused on the front of the face, particularly the eyes and mouth. 3. We just don't see square jaw corners as key male identifiers in the way that we do an Adam's apple or heavy brow ridge. Part 8: How Feminine is Feminine Enough?